After nearly 36 years with the Federal Highway Administration (FHWA), I have decided the time has come to make a change. When I joined FHWA in 1975, I could have never foreseen the experiences and opportunities that have filled these past decades. It has truly been a privilege. During my tenure, I had the honor of serving as the first Associate Administrator of the Office of Professional and Corporate Development and as the Associate Administrator for Safety in the Office of Safety. Furthermore, I was pleased to hold the positions of Acting Executive Director where I oversaw the Agency operations, Director of the Office of Technology Applications and Deputy Regional Administrator in the Agency's former Mid-Atlantic Region. Throughout the years I kept finding things that I could be really passionate about and feel extraordinarily lucky to have worked in an environment that allows people to show that passion. While there are a number of things I plan to pursue, I look forward to staying engaged with the transportation community. I'm proud of my work at FHWA because I know what we do here not only improves transportation, but saves lives too. I'd like to see what can happen from here. My thanks to all of you who have made this time so special, particularly all of you who I have worked with in safety. I don't think there is anything that we can do that is more important than helping prevent deaths and serious injuries. You are a committed team and you have truly made a difference. Note: Joseph Toole retired on June 3, 2011. "I always felt Joe was the consummate professional," said Peter Kissinger of the AAA Foundation for Traffic Safety. "He is one of the most passionate people I know regardless of the mission." "The magnitude of your impact at FHWA has been tremendous.....you developed and delivered policies and programs that improved highway safety contributing to historic lows in traffic fatalities. Your accomplishments leave an enduring legacy at FHWA and with the individuals and organizations affected by our Agency." Tony Furst will serve as the Acting Associate Administrator until this key position is filled. 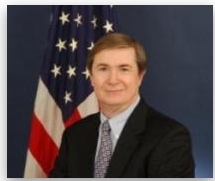 Tony currently serves as the Director of the Office of Freight Management and Operations, leading FHWA efforts in freight policy, freight performance and technology, truck size and weight, and freight capacity building. Tony has 25 years experience with USDOT including the Coast Guard, the Maritime Administration, and the Transportation Security Administration. Please extend a warm welcome to Tony as he begins his new position with the Office of Safety. 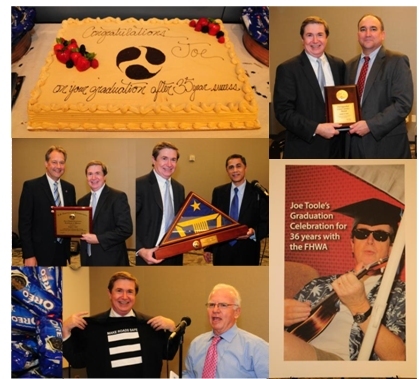 Joe Toole was honored at a retirement party on June 1, 2011. We thank him for dedication and service to USDOT and FHWA and wish him well in his new endeavors. A new print ad campaign featuring Federal Highway Administrator Victor Mendez and other transportation leaders is delivering messages about the importance of safety in roadway construction zones and helping boost utilization of the National Work Zone Safety Information Clearinghouse. In the full-color ads, a prominent photo of Mendez is juxtaposed with text that reads: "FHWA Administrator Victor Mendez knows safety on the job saves lives down the road. That's why he recognizes the importance of the National Work Zone Safety Information Clearinghouse." The public services announcements direct people to the Clearinghouse website (www.workzonesafety.org) to access webinars, best practice materials, laws and regulations, statistics, training, and public education campaigns. The ads will appear in Transportation Builder, Better Roads, Roads & Bridges, and other industry publications. The Clearinghouse also has produced free educational resources for the roadway construction community and motoring public. The latest in a series, the "Know Flagging" poster is designed to educate workers on flagging best practices, basic temporary traffic control rules and common hazards. In response to the growing number of Spanish-speaking road construction workers, a series of basic brochures are being developed. The first is "Basic Spanish for Safety and Emergencies," which provides phrases for common emergency situations. The Clearinghouse is owned and operated by the American Road & Transportation Builders Association's Foundation. It is supported by the Federal Highway Administration, and the Texas Transportation Institute, which manages day-to-day operations. Today, the facility is serving more than 200,000 users annually. For a complete list of all Clearinghouse resources, visit a www.workzonesafety.org. The Accelerated Safety Activities Program (ASAP) helps FHWA Division Offices promote safety innovation. As the name implies, ASAP provides funding to accelerate the advancement of safety efforts across the nation. Program funds are awarded as seed money to help build on successful efforts, expand on partnering opportunities, and provide an avenue of outreach for local practitioners to exchange successful practices. In 2011, $100,000 is available. In 2010 and 2011 the Office of Technical Services (OTS) Safety and Design Team received funding from the Headquarters Office of Safety for program stewardship and oversight. Each year OTS sends a solicitation out to FHWA Division Offices and their safety partners for candidate projects. A panel of safety experts from various FHWA offices scores and ranks the projects. Funds are distributed according to their ranking. ASAP is very competitive. In the last 2 years, Division Offices and/or their partners have submitted 90 project nominations. Ultimately, 34 of these projects received funds. Selected projects are producing valuable products and results. A successful ASAP project from 2010, Rumble on the Reservation, was featured in the Fall/Winter 2010 issue of The Safety Compass. We are looking forward to similar successes in 2011. For additional information on this program, please contact Patrick Hasson at patrick.hasson@dot.gov or Mark Sandifer at mark.sandifer@dot.gov. Recognizing the immense benefits and impacts of social networking, FHWA officially launched its Facebook and YouTube sites on March 17. FHWA plans to use both sites to quickly share information, tools, resources, updates, best practices, and highway success stories with transportation industry stakeholders and the general public. FHWA Executive Director, Jeff Paniati, stated "Facebook and YouTube offer the opportunity to share a wide range of information with diverse audiences," and FHWA is excited about the opportunity to expand its audience and continue the dialogue on ways to improve highway transportation. FHWA is a proud proponent of innovation, and believes that social media is an excellent way to advance core messages and offer greater transparency and accountability to the traveling public. FHWA encourages stakeholders and those interested in highway information to link to their social media sites and share with other industry partners. The U.S. Department of Transportation's (USDOT) Livability Initiative enhances the economic and social well-being of all Americans by creating and maintaining a safe, reliable, integrated, and accessible transportation network that enhances choices for transportation users, provides easy access to employment opportunities and other destinations, and promotes positive effects on the surrounding community. Secretary LaHood identified livability as a key priority for transportation, and his vision is that "transportation policies focus on people and communities who use the transportation system." 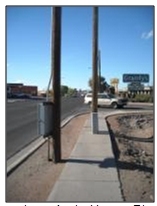 In the spirit of incorporating safety into livability projects, the FHWA Office of Safety partnered with the FHWA Office of Planning and Environment in October 2010 to sponsor an RSA on the El Paseo Road Corridor in Las Cruces, New Mexico. The El Paseo Road corridor is one of four selected from across the country to receive an Environmental Protection Agency (EPA) technical assistance grant. It also is the only corridor to have EPA partnering with the Department of Housing and Urban Development (HUD) and FHWA. The EPA technical grant focused on guiding the planning process to a shared vision of a revitalized transportation corridor. The RSA was geared to accomplishing a safety examination that would ultimately help assist the City create a transportation plan. In addition, the agencies involved wanted to develop a comprehensive planning approach and a potential working model for future use. A multidisciplinary team consisting of transportation professionals from RoadRUNNER Transit, Las Cruces Metropolitan Planning Organization (MPO), Las Cruces Public Works, Las Cruces Police Department, the New Mexico Department of Transportation, the FHWA New Mexico Division Office and RSA technical experts performed the RSA. The team spent two days studying the corridor using aerial photographs and on-site visits. As part of the field review, the team took guided driving tours both during the day and at night to record issues faced by drivers. The team met with the Director and staff from the Public Works Department to discuss many of the corridor's long-term problems, as well as proposed projects. The team also met with representatives from Las Cruces Public Schools to outline short- to long-term issues and projects at Las Cruces High School. Drivers generally do not yield the right-of-way to pedestrians in marked crosswalks at uncontrolled sites. One alternative to in-roadway signs and yellow flashing beacons is to add yellow LED Rectangular Rapid-Flashing Beacons (RRFB) to pedestrian warning signs. These LED RRFBs are similar in operation to emergency flashers on police vehicles. The photo to the left shows an RRFB mounted below a W11-2 pedestrian warning sign at a crosswalk. 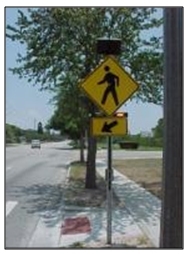 To provide a more objective understanding of the effects of RRFBs, FHWA conducted a study of these pedestrian warning devices to determine whether they increased driver yielding to pedestrians. This study was part of a larger FHWA research effort to quantify the effectiveness of existing and new engineering countermeasures in improving safety and operations for pedestrians and bicyclists. The study report presents the results of five RRFB experiments, comparing variations in the features or installation of RRFBs. The report can be found at the following website: https://www.fhwa.dot.gov/publications/research/safety/pedbike/10043/. Experiment 1 – Two- and Four- Beacon Systems. Installation of the two-beacon RRFB system increased yielding compliance at multilane uncontrolled crosswalk locations from 18 to 81 percent. Yielding compliance increased from 81 to 88 percent following the installation of the four-beacon system at these sites. Experiment 2 – RRFBs vs. Traditional Overhead and Side-Mounted Yellow Flashing Beacons. Installation of a standard yellow overhead beacon increased yielding compliance from 11 to 16 percent. When side-mounted RRFBs replaced the overhead beacon, yielding compliance increased to 78 percent. Adding the RRFB to the median island increased yielding compliance to 88 percent. The installation of standard yellow side-mounted beacons increased yielding compliance from zero to 16 percent. The installation of side-mounted RRFBs increased yielding compliance to 72 percent. The increases produced by the RRFB system were statistically significant. Experiment 3 – RRBD Effectiveness Over Time. RRFBs were effective at 22 sites and showed that the effects were maintained over time at each location. Experiment 4 – LEDs Pointed at Traffic and Momentary Light Bars. LEDs pointed at oncoming traffic increased yielding compliance. Further increases in yielding were not achieved by adding momentary light bars (MLB). Experiment 5 – Advance Warning Devices. Using advance warning devices placed before the crosswalk along with RRFBs did not increase yielding compliance due to RRFBs alone, but may have increased the distance that drivers yielded in advance of the crosswalk. These experiments show that the rectangular LED yellow rapid-flashing beacon appears to be an effective tool for increasing the percentage of drivers yielding right-of-way to pedestrians in crosswalks at sites where drivers rarely yield to pedestrians. For more information contact Ann Do, 202-493-3319, ann.do@dot.gov. 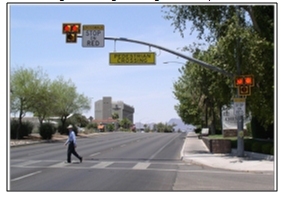 In the late 1990s, Tucson, AZ, developed the High intensity Activated crossWalK (HAWK), a beacon to assist pedestrians in crossing major arterials. Early evaluation seemed very promising, indicating driver yield percentages greater than 95 percent, even on major streets with multiple lanes or higher speeds. A decade later with few pedestrian crossing treatments having high yield rates on major arterials, FHWA sponsored a study to objectively evaluate the HAWK's safety effectiveness. This study confirmed the earlier indications of the effectiveness of the HAWK. The HAWK is a pedestrian-activated beacon located on the roadside and mounted on mast arms at intersections (see photo below). The HAWK head consists of two red lenses over a single yellow lens. The HAWK beacon is dark until it is activated by a pedestrian. Activation triggers the warning flashing yellow lens on the major street. After a set time, the indication changes to a solid yellow light to inform drivers to prepare to stop. The beacon then displays a dual solid red light to drivers on the major street and a walking person symbol to pedestrians. At the conclusion of the walk phase, the beacon displays an alternating flashing red light, and pedestrians are shown an upraised hand symbol with a countdown display informing them of the time left to cross. During the alternating flashing red lights, drivers can proceed after coming to a full stop and checking that pedestrians have already crossed their lane of travel. Each successive driver is legally required to come to a full stop before proceeding during the alternating flashing red phase. The alternating flashing red phase allows the delay to traffic to match the actual crossing needs of the pedestrians. Drivers can proceed with a stop-and-go operation during the flashing red phase. If pedestrians need more time, then the drivers remain stopped until they finish crossing. The ability to balance the pedestrian needs with driver delay is a valuable component of the HAWK treatment. The HAWK pedestrian crossing beacon is a useful tool for improving pedestrian safety under appropriate conditions. Just like any other warning traffic control device, it may not work as effectively if it is overused. In addition, the high crash reductions identified in this study may not be achieved at other locations if the site has different characteristics, such as reduced pedestrian activity. For more information, contact Ann Do, 202-493-3319, ann.do@dot.gov or view the report (https://www.fhwa.dot.gov/publications/research/safety/10045/). 1 Statistically significant at the 95 percent confidence level. 2 Not statistically significant at the 95 percent confidence level. Features in several evaluation modules, the graphical user interface, Highway Viewer, and output/reporting capabilities have all been improved in the update. The updated software is available for downloading at no charge, although downloading requires user registration. A suite of software analysis tools for evaluating the safety and operational effects of geometric design on highways, IHSDM includes six evaluation modules: Crash Prediction, Policy Review, Design Consistency, Traffic Analysis, Driver/Vehicle and Intersection Review. For a general overview, see: http://www.ihsdm.org/w/images/a/aa/IHSDM_Overview_March_2011.pdf. To the extent possible, the Crash Prediction Module (CPM) implements Part C (Predictive Method) of AASHTO's 1st Edition Highway Safety Manual (June 2010) for evaluating rural two-lane highways, rural multilane highways and urban/suburban arterials. The Design Consistency Module (DCM) applies both to lower-speed (posted speed 25 to 40 mph) and to higher-speed (posted speed greater than 40 mph) highways. The software includes extensive reporting capabilities, and the tutorial includes lessons on data entry and output/reporting. The Crash Prediction Module Lesson includes exercises for rural two-lane and rural multilane highways, as well as an urban arterial. IHSDM is well supported through a help-line, e-mail, and a National Highway Institute Course (Course Number FHWA-NHI-380071). The two-day NHI training course will provide participants an understanding of the principles underlying IHSDM evaluations and hands-on exercises using the software. The course will instruct highway design project managers, planners, designers, and traffic and safety reviewers in the application of the IHSDM software and will provide guidance on interpretation of the output. The National Safety Council has partnered with GSA to provide free training to any agency that operates government vehicles. The online course allows you complete the training at your own pace (up to one year after registration). Upon successful completion (80% or better) you will receive a Certificate of Completion, which you can present to your insurance company for a possible discount of up to 15%. For more information please contact Debra Ann Ferris, National Safety Council, (703) 244-5996. Six years after the passage of the Safe, Accountable, Flexible, Efficient Transportation Equity Act – A Legacy for Users (SAFETEA-LU), advances in the science of safety have ushered in noteworthy approaches for States, regions, and localities to address safety issues and challenges, and the difference is clear. In 2010, motor vehicle fatalities fell to the lowest levels since 1949. SAFETEA-LU requires that States develop and implement Strategic Highway Safety Plans (SHSP) as part of the Highway Safety Improvement Program (HSIP). HSIPs became part of a broader vision involving multiple stakeholders and integrating safety into the planning process, with the common goal of achieving significant reductions in traffic fatalities and serious injuries on all public roads. Toward that end, new noteworthy practices emphasize multidisciplinary, multimodal, system-wide strategies for planning, implementing, and evaluating safety projects and programs. The Noteworthy Practices Series documents and shares these practices. In developing the HSIP Noteworthy Practice Series, FHWA examined safety programs around the country to identify and document successful, innovative, and effective HSIP practices. The objective is to share experiences and inspire States to incorporate new strategies and continue improving their safety programs toward the end goal of further reducing fatalities and serious injuries. States are proud of their successful practices and want to share this information with agencies that are eager to learn about what others are doing and explore opportunities to adopt such practices into their own programs. Many States are participating in safety peer exchanges, which provide opportunities for collaboration and information sharing. States are adding to the knowledge base on countermeasure effectiveness by contributing to research activities and submitting their evaluation results for broader application through such resources as the Crash Modification Factors Clearinghouse. In addition, many States participate in efforts to document their experiences and the knowledge they have gained through the implementation of their safety programs. Safety Data Collection, Analysis, and Sharing. Use of the HSIP Flexible Funding Provision. The Illinois Department of Transportation, with the assistance of the University of Illinois, developed safety performance functions (SPFs) for all State routes and intersections to use in the network screening process. This has enabled the State to shift the emphasis of the HSIP away from densely populated urban areas, resulting in more low-cost safety improvements or systemic improvements that may not have been identified using previous screening methods. The Nevada Departments of Transportation and Public Safety conducted a series of road show meetings across the State in an effort to further engage safety stakeholders, educate them about the statewide SHSP, and provide an opportunity for input into the SHSP update. The Louisiana Department of Transportation and Development is among the first DOTs to hire a Law Enforcement Expert (LEE) dedicated to working with law enforcement agencies on improving crash data collection. The Utah DOT used the HSIP flexible funding provision to support education and outreach programs linked to Utah's Comprehensive Safety Plan (the State's SHSP). Each HSIP Noteworthy Practices series includes an introduction to the topic and a collection of noteworthy practices. Details include practice summaries, key accomplishments, results, and contact information. States are encouraged to let us know about their successful experiences so we can continue to share; FHWA is working on new ways to communicate successful approaches. 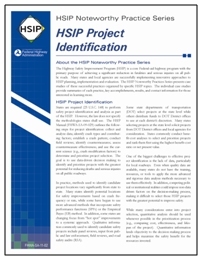 Download the HSIP Noteworthy Practices (Report No. FHWA-SA-11-02) online from the FHWA Office of Safety at: http://safety.fhwa.dot.gov/hsip/resources/fhwasa1102/toc.cfm. Copies also can be requested from FHWA's report center at: report.center@dot.gov. For more information, please contact Ben Gribbon, FHWA Office of Safety Programs, 202-366-1809, benjamin.gribbon@dot.gov. 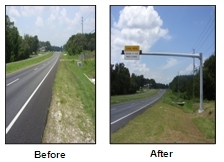 The FHWA Florida Division Office and the Florida DOT District Seven have teamed up to develop and implement an innovative contracting process to speed up the delivery of traffic safety projects. These traffic safety projects are often too large to be handled by maintenance crews and too small to incorporate individually into the FDOT standard five-year highway construction work program given the time and effort needed to hire consultants and contractors. This traditional process led to a large surplus of unused Federal-aid safety funds; therefore, a new way of doing business was needed. The FHWA and FDOT team focused on establishing a process that would expedite the safety projects while maintaining fiscal responsibility, transparency, and accountability. Through their dedicated cooperative efforts, the team created the Design-Build Push-Button (DBPB) process. DBPB evolved from two things: 1) Florida's 20 years of experience using design-build contracting, and 2) "pre-event" contracts used to expedite hurricane repair. DBPB combines the time-saving benefits of the design-build process with the quick-turnaround of push-button contracts. The result is a very quick and efficient process to go from "concept to concrete" in delivery of traffic safety projects. This innovative contracting method allows for safety projects to be developed, designed, and built in less than one half the time of traditional contracting methods. Timely contracting was especially important to the Tampa area because during 2009, 388 people died in motor vehicle traffic crashes including 104 pedestrians and bicyclists. That amounts to one person killed every day and one pedestrian or bicyclist killed every three days. One of the challenges of making these small projects eligible for Federal-aid is that since the location of the work is not known in advance, the planning and NEPA steps are not complete. In addition, the team had concerns about fitting these projects into a design-build contracting method because the locations and scopes of the projects were unknown. After several rounds of discussions, the team determined that FHWA would review and approve the RFP, which would include a list of potential pay items. FHWA authorized safety funds for the initial task work order based on locations known at that time. Additional tasks would be added and funds authorized as the planning processes and NEPA evaluation steps are completed. The fee for design is a set percentage of construction costs. Traffic safety projects can provide huge benefits in terms of reducing crashes, saving lives, and improving livability. The DBPB process delivers projects faster, cheaper, and more efficiently while creating jobs, resulting in people going back to work quickly. The DBPB process also works very well with the Florida DOT District Seven's Road Safety Audit (RSA) process. An RSA is the formal safety performance examination of an existing or future road or intersection by an independent, multi-disciplinary team. It qualitatively estimates and reports on potential road safety issues and identifies opportunities for improvements in safety for all road users. District Seven has been very aggressive in performing RSAs throughout the five-county Tampa Bay region. At the conclusion of the RSA process, the RSA findings can be turned over to the DBPB team so they can implement improvement projects quickly. In the first fiscal year of operation, the DBPB contract programmed 23 traffic operations and safety projects valued at more than $13 million. Nine of the projects were funded with Federal-aid safety funds and 14 projects were State funded. The projects included: over 50 miles of inverted profile markings to reduce nighttime run-off-road crashes; pedestrian enhancements at nearly 300 intersections; traffic signal improvements at 11 locations; and other safety enhancements. Future projects will include additional traffic signal improvements, pedestrian enhancements, access management improvements, and ITS improvements. The DBPB process also continues to serve as a way to implement the findings of the District Seven RSA program by providing a comprehensive approach for addressing safety issues. The DBPB process will continue to save time, money, and lives as well as put people back to work quickly. After implementing DBPB in Tampa, district staff presented their evaluation of the process to FDOT leadership. Those results were so well received that FDOT and the FHWA Florida Division will extend the use of DBPB from the Tampa area to other districts during a one-day workshop this summer. FDOT and FHWA Florida Division also will share their DBPB success with other States during a webinar presentation on June 29, 2011 at 11:00 AM EST. For more information about the Design-Build Push-Button contract, contact Hussein Sharifpour, hussein.sharifpour@dot.gov. In the fall of 2010, the Project Manager for the Indiana Local Technical Assistance Program (LTAP) Center's new Hazard Elimination Program for Existing Roads and Streets (HELPERS) spent several days shadowing veteran safety specialists at the Iowa and Louisiana LTAP Centers. The Indiana LTAP Center hired the HELPERS Project Manager to enhance its local road safety program. While the Project Manager came well-versed in roadway safety, certain aspects of the LTAP environment and the nuances of local and rural road safety were new. To give the Project Manager a head start, the FHWA Office of Safety Local and Rural Roads Safety Peer-to-Peer (LRR P2P) Program provided training assistance. The LRR P2P Program provides peer assistance in the development and delivery of local and rural road safety programs and projects. Experts with knowledge in local and rural road safety volunteer their time as peers to help local agencies on roadway issues. Peers can assist with crash data analysis and determining locations needing attention; identifying low-cost safety improvements that can be installed quickly; training on innovative safety strategies; and other topics. Some examples of peer assistance over the past year include sharing details of agency maintenance programs to comply with the new sign retro-reflectivity requirements and providing input and guidance on the installation of mid-block crossings. For the Indiana HELPERS Project Manager, peer assistance consisted of shadowing local and rural road safety practitioners from University-based LTAP Centers in other States. The LRR P2P Coordinator worked with the Project Manager to identify appropriate LTAP Centers, coordinated with Iowa and Louisiana to set up visits, and facilitated pre-visit discussions. The LRR P2P Coordinator also made all necessary travel arrangements. Armed with knowledge from the two LTAP site visits, the HELPERS Project Manager returned to the Indiana LTAP Center to share this information with her co-workers and apply it to the day-to-day activities of the Center. The Project Manager currently assists local agencies with a range of road safety issues including Road Safety Audits, crash data analysis, and applications for safety funds. She plans to increase efforts to reach out to local agencies, law enforcement, and communities to educate and actively involve these organizations in local and rural road safety. She also intends to establish a systemic approach to increasing roadway safety by addressing intersections and curves with standard packages of improvements, promoting use of the Safety Edge to local agencies in Indiana, and keeping track of best practices for inclusion on the Indiana LTAP website. If you have experience with local and rural road safety and are interested in serving as a peer, we would appreciate hearing from you as well. Please send an email with your interest to Heather Rigdon at heather.rigdon.ctr@dot.gov. For information on the Local and Rural Roads Safety P2P program contact Rosemarie Anderson, rosemarie.anderson@dot.gov or visit our website, http://safety.fhwa.dot.gov/local_rural/training/p2p/. The FHWA Office of Safety has developed three new manuals focusing on reducing crashes on rural roadways owned and maintained by local agencies. FHWA created these manuals in coordination with the local and rural highway agencies to resolve safety problems on the roads they maintain. In order to reduce fatalities and serious injuries on our nation's road network, local and rural highway practitioners have to integrate safety into their projects and programs routinely. The majority of the nation's roadways are owned, operated, and maintained by numerous small agencies. These manuals provide access to road safety information and the resources needed to address the safety issues these practitioners face. The three individual manuals – Intersection Safety, Roadway Departure Safety, and Roadway Safety Information Analysis – provide the local practitioner with the procedures and processes to improve the safety of local rural roads and to reduce the potential for future crashes. The Intersection and Roadway Departure Safety Manuals provide a framework by which users may assess the safety of specific locations as well as the network and determine whether countermeasures should be installed. Each document presents proven countermeasures and a process for the planning and implementation of safety improvements. The Roadway Safety Information Analysis Manual provides data collection and analysis techniques as well as other processes applicable to the local practitioner to help improve the safety of local rural roads. The information will acquaint local practitioners - regardless of background or experience level - with the sources, calculations, tools, and methods to make data-supported decisions regarding local rural road safety. The manuals can be accessed from the Office of Safety website by the following link http://safety.fhwa.dot.gov/local_rural/training/. For general information on these manuals contact Rosemarie Anderson, rosemarie.anderson@dot.gov.